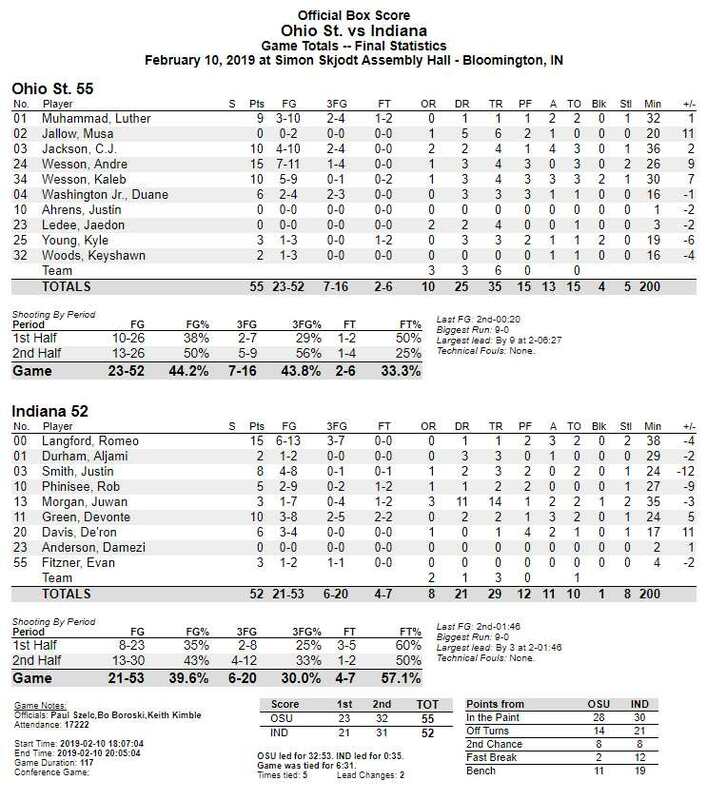 Despite controlling most of the game, the Buckeyes (16-7, 6-6) still needed a clutch steal and dunk from junior forward Andre Wesson in the final seconds to secure a 55-52 win at Indiana (13-11, 4-9). For every Hoosier run on Sunday afternoon, Ohio State offered up just the right amount of response to settle things back down again. The Buckeyes were led on the day by Andre Wesson with 15 points. He also grabbed four rebounds and came up with a pair of timely steals. The other OSU scorers in double figures were Kaleb Wesson and CJ Jackson, both with 10 points each. Indiana was held to 21-of-53 shooting (.396) from the field and hit just 6-of-20 three-point attempts against an active Ohio State defense. Had it not been for the Buckeyes suffering another spell of bad passing, this game would have never come down to the final seconds. Fortunately for OSU, Indiana wasn’t equipped to capitalize on many of the gifts they were given. It took less than five minutes for Ohio State to open a 9-point lead in the first half against the Hoosiers, and all nine points came in a span of 81 seconds. Luther Muhammad got things started with a three-pointer, which was then followed by layups from Kaleb Wesson, Muhammad, and Andre Wesson. Indiana freshman guard Romeo Langford’s three-point basket stopped the OSU run, making it 11-5. Langford’s three was followed by three-consecutive Buckeye turnovers, which were converted into two baskets for the Hoosiers. Ohio State was able to keep control of the lead, however, and even extended it to 21-14 a few minutes later on a three-pointer by freshman guard Duane Washington. Indiana closed the first half on a 7-2 run to cut OSU’s lead to 23-21. 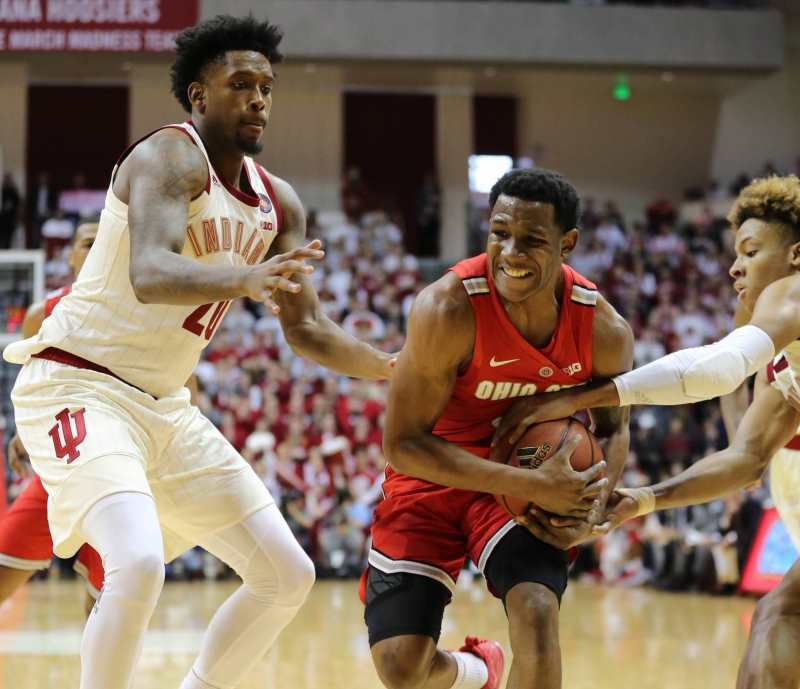 Ohio State turned the ball over nine times in the first half and began the second half the same way, as Indiana forward Justin Smith stole a bad pass from Kaleb Wesson. That steal turned into an eventual offensive rebound and layup by Smith to tie the game at 23-23. As they did for most of the game, however, the Buckeyes answered. This time with a 7-0 run with two Kaleb Wesson baskets and a three from Muhammad. A steal and layup by CJ Jackson a bit later made it a 34-25 game with 15:57 remaining. Indiana’s De’ron Davis scored on two-consecutive possessions a couple of minutes later to make it 36-32, but Jackson dropped in a clutch three to cool the Hoosiers’ jets with just under 13 minutes to play. Indiana was able to get it back down to 42-38, but a layup and a three from Andre Wesson moved it back up to nine points with 6:27 to play. That 9-point lead evaporated in the span of three Hoosier jumpers — all from beyond the three-point arc. Indiana tied the game 47-47 with 4:54 remaining. The Hoosiers then had an opportunity for their first lead of the game, but Andre Wesson picked off a bad pass from Devonte Green, and then grabbed an offensive rebound following a Keyshawn Woods miss and put it back up and in for the 49-47 lead. Freshman Hoosier point guard Rob Phinisee answered right back, driving down the lane for a layup to tie it at 49-49 with 2:48 remaining. Phinisee stole the ball from a driving Jackson on OSU’s next possession, and with the shot clock winding down, Green hit a deep three with 1:46 to play to give Indiana their first lead of the game. Thirty-two seconds later, standing flat-footed 21 feet from the basket, CJ Jackson threw up his own desperation three, which dropped in to tie the game with 1:11 left on the game clock. Andre Wesson stole a Juwan Morgan pass on the ensuing possession and Buckeye head coach Chris Holtmann called a timeout with 34 seconds remaining. Coming out of the timeout, Andre Wesson set up for a pick and then rolled to the basket, where he was fed the ball and then dunked it home for the 54-52 lead with 20 seconds to play. Langford’s three-pointer on Indiana’s next possession did not fall and IU was forced to foul. Luther Muhammad went to the line for a one-and-one with eight seconds to play. He hit the first and missed the second, but Green’s game-tying three-pointer fell short and the Buckeyes walked out of Assembly Hall with a 55-52 win. Ohio State outrebounded Indiana 35-29 and shot 13-of-26 in the second half, including 5-of-9 from three-point territory. Andre Wesson scored 15 points on 7-of-11 shooting, and even though he was only 1-of-4 from three, that three came late in the second half to give the Buckeyes a 9-point lead. Wesson was effective down on the block, proving to be a difficult post matchup for any Hoosier tasked with defending him. As mentioned earlier, he also had the big steal at the end of the game to give Ohio State the upper hand in the final minute. + Sophomore Musa Jallow started once again, and once again he went scoreless in 20 minutes of action. He still grabbed a team-high six rebounds and played outstanding defense. He also led the team in plus/minus with a mark of +11. + Once again freshman guard Duane Washington hit some important three-pointers, which is great to see as the 2018-2019 regular season closes out. Washington scored six points, connecting on two of his three attempts from deep. + Freshman guard Luther Muhammad had is hands full helping to defend Indiana freshman guard Romeo Langford. Langford scored 15 points, which was a couple of points below his season average. Muhammad scored nine points in 32 minutes of play, connecting on 2-of-4 from three-point territory. Muhammad was just 1-of-6 from inside the arc, however. How is the +/- calculated? If a player is +5, it means his team outscored the opponent by 5 points when he was on the court. If he is -5, it means his team was outscored by the opponent by 5 points. The Bucks needed this one badly, and got it. Keep rolling!